The Orologeria Duomo Milano (the Duomo Milan Watchmaker’s) was created thanks to three friends’ collaboration. Despite their young age, the three partners can boast a twenty-years experience in these fields. 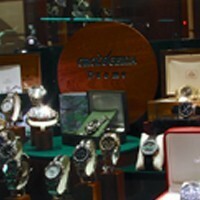 The partners met in the second half of the eighties at the Milan “Scuola di Orologeria” (Horological Institute). As a result of a series of lucky events, in October 2004, the three friends decided to bring together their personal experience and created a new commercial project based in one of the most famous world historic and cultural centres: Piazza del Duomo (The Duomo Square) in Milan.